My Bee Sewcial gals may disown me, as I just might have gone off the deep end when it comes to my inspiration for this month. But gee, we've had nature and design elements, minimal color and maximum, even music. But in 18 months of being together, there's been no mention of food. Well I'm changing that and calling all of my bee-mates to the table, where the central prompt this month is ..... drumroll ..... BACON. Yup. You heard me. 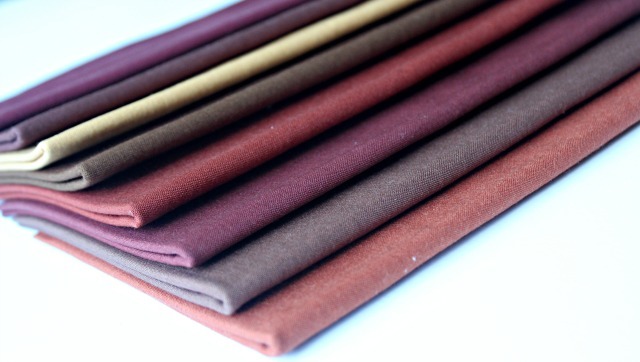 And if that's not enough, the palette will consist of colors such as Kona solids Brick, Brown, Mocha, Chestnut, Spice, Cinnamon, Cocoa, and Caramel, though all solid fabrics are welcome. If a 'background' or more neutral element is needed, I'm asking for off-white or natural, not white-white. Linen, shot-cotton, leather, or any other texturally-interesting substrates are most welcome. I'm requesting any size square or rectangular blocks, as long as two opposite sides equal 12.5" unfinished, all adding up to the equivalent of 2 - 12" finished blocks. I'd prefer no applique of any kind. Ruler-free piecing is encouraged but not mandatory, except for the final squaring up. For those of you who would like to join in via the #inspiredbybeesewcial hashtag, please do not feel the need to take this prompt literal to the extreme! Be inspired by bacon. If your creations do not specifically look like bacon, that is ok! And yes, I've created a whole bacon-inspired pin board, but have chosen not to make inspiration blocks this time. I'm just really curious to see where this prompt takes folks. 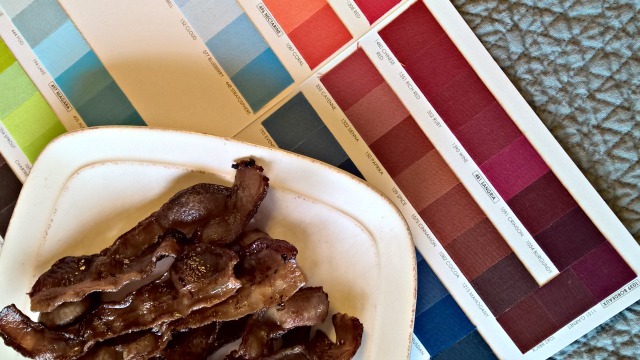 So have fun creating with this unconventional theme as we wake up and smell the bacon! This made me start the day with a laugh! I love that rich dark palette and I am off to look at your pinboard. Yum! And this struck me as funny because I just got home from a walk to the bank to pay a bill. As I approached a restaurant at the plaza I could smell bacon, so after paying the bill, I had to stop there for breakfast . . . and yes, it included bacon! I look forward to seeing everyone's blocks. That is a lovely array of colours, did I tell you I'm vegetarian? Hehe, I've just made two sultana cakes and a vegan carrot cake, not that I'm vegan but it's a lovely recipe. Oh, I can't wait to see what everyone comes up with! I love this! I was reminded of Chopped, and transforming the special ingredient. If bacon is the inspiration, why not add tomatoes, maple, eggs, any number of complimentary items, this is a great challenge! Too funny Debbie! What if someone goes with bacon in it's living (pig) form? So clever, Debbie. Yes--food - inspired quilts are a definite yes! In my book! 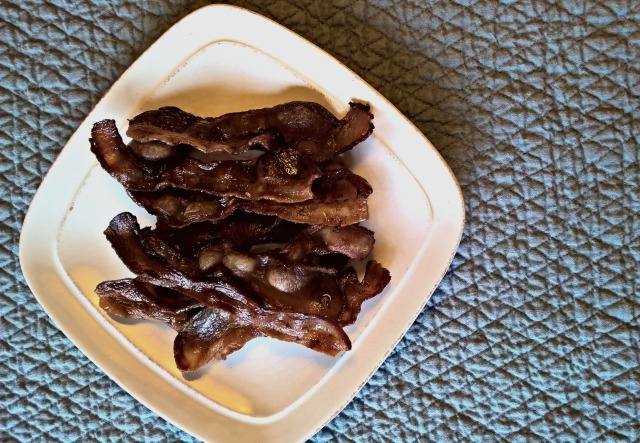 I wish I had read this post this morning...now I"m going to bed dreaming of bacon! Can't wait to see bacon "renderings"! This is awesome! I can't wait to see what everyone comes up with! I think that this palette is really rich in colors and I am excited to see where this takes the group! I opened this the other morning and just loved it. The colors are warm and rich, although toast that dark might be a problem. Is Lady Gaga in your bacon bee? Looking forward to the creative results. It's Time for the Crosscut Quilt-Along! 2016 Finish-A-Long :: Q2 Winners! 2016 Finish-A-Long :: Q3 Now Open!